Japan’s negotiating skills will be put to the test as Tokyo tries to fend off U.S. demands for a bilateral free trade agreement and counter the threat of tariffs on cars and auto parts. The longtime allies are set to launch high-level trade talks Thursday in Washington after months of preparations that saw Japan complete domestic procedures to ratify the Trans-Pacific Partnership agreement after the U.S. quit and sign a free trade deal with the European Union. Wary of U.S. pressure to open the agricultural sector, Japan is expected to stress the advantages of multilateral trade frameworks. “First, I want to listen to what the U.S. side has to say during the meeting. But Japan won’t make an agreement that goes against its national interests with any country,” Motegi told reporters. 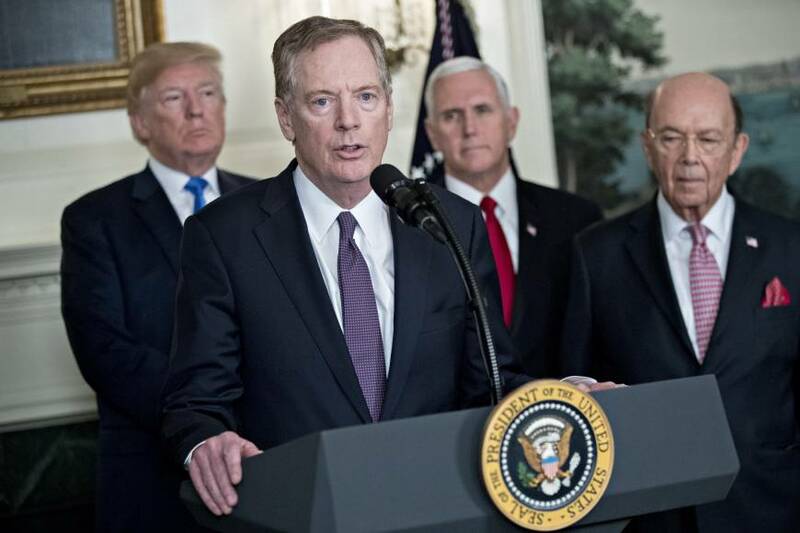 Ahead of the U.S. midterm elections in November, trade experts say that U.S. President Donald Trump will be looking to produce results and that the first round of the new economic framework will be critical. “If Japan makes easy concessions, and for instance agrees to start negotiations for a bilateral free trade agreement because the United States threatens to impose higher auto tariffs, its trade strategy taken so far will break down,” said Junichi Sugawara, senior research officer at Mizuho Research Institute. Japan has largely taken a wait-and-see stance without resorting to retaliatory steps since the imposition earlier this year of higher tariffs on steel and aluminum imports. Although Washington is still conducting an investigation into whether auto imports pose a national security threat, the prospect of higher tariffs — up to 25 percent — has given car-exporting countries like Japan a reason to worry. For now, securing an exemption may be high on Tokyo’s priority list as analysts expect the potential impact on the auto industry and the global economy to be serious. “It’s reasonable to seek an exemption from a practical point of view. But if Japan continues to uphold free trade, it needs to urge the United States to drop the plan in the first place,” Sugawara said. Postwar Japan has a long history of trade friction with the U.S. in fields ranging from textiles and beef to cars and semiconductors. Following auto talks in the 1990s, Japanese automakers stepped up car production in and purchases of auto parts from the U.S.
Japanese officials will also likely explain that Japanese auto companies have been making contributions to the United States, a major market where they produce nearly 3.8 million vehicles a year. According to economists at the Daiwa Institute of Research, if a 20 percent tariff is imposed on cars and auto parts imported from Japan, it would mean an additional ¥950 billion ($8.5 billion) in costs. When taking into account the impact of U.S.-bound products manufactured and shipped out of countries such as Mexico and Canada by Japanese automakers, the total amount will swell to at least ¥1.75 trillion. “It’s better to see it as a ‘trump card’ to crack the unity of the TPP or the coalition trying to keep the United States in check,” said Hideo Kumano, executive chief economist at Dai-ichi Life Research Institute. “Japan has been playing its role as a flag-bearer for free trade. And yet we are at a critical juncture now before (the threat of) auto tariffs. The storm may be rough,” Kumano added. The high-level dialogue comes after the United States and the European Union agreed in July to open negotiations to remove trade barriers and avoided escalating a trans-Atlantic trade war. 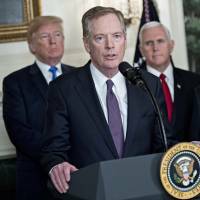 Trump’s rhetoric on trade, his abrupt withdrawal from the TPP and the levying of higher tariffs on imports from major trading partners have rattled financial markets. They also provided countries an added impetus to seek a multilateral approach to resist the rise of protectionism. The list of countries seen willing to join the 11-member TPP has also been expanding and now includes Colombia, Thailand and South Korea. Just before announcing the schedule for the Japan-U.S. dialogue on Tuesday, Motegi discussed the importance of a free and rules-based trade system with British International Trade Secretary Liam Fox and welcomed Britain’s willingness to enter the TPP. Still, it’s an open question as to whether the United States will eventually return to the multiparty trade deal. “What’s important going forward is to show that there are no advantages in staying out of multilateral frameworks like the TPP,” Mizuho’s Sugawara said.